Sprint swimming is like the 200 or 400 meters. The 50m freestyle sprint has the same energy cost of a 200m Track & Field sprint. Same with 100m swim and 400m run. The study (from the University of Poitiers in France) compares the use of Electrical Muscle Stimulation (EMS) with conventional dry-land strength training protocols in the preparation of National level sprint swimmers. Here is the full article (with permission), with the original article appearing here. The study, undertaken at the University of Poitiers in France, compares the use of EMS with conventional dry-land strength training protocols in the preparation of national level sprint swimmers. A total of 24 swimmers (12 men, 12 women), at an average age of 22 years, were divided into three groups. One group undertook a conventional dry-land strength training program, another group used only EMS and the third group didn’t undertake any strength training method. All groups continued with their regular 10 swimming training sessions per week for a four-week training period. Athletes were tested before the training period (W0), immediately after the training period (W4) and four weeks following the end of the training period (W8). Researchers analyzed peak torque during arm extension at different velocities, stroke rate and stroke length during a 50m front crawl in all of the testing periods. The dry-land strength training program (S) focused on upper limbs with a special emphasis on latissiumus dorsi. Each strength training session was 15 minutes in length, preceded by a 10 minute jump-rope warm-up. Athletes completed three strength training sessions per week, one hour prior to swimming training. Three sets of three exercises were performed with two minutes of rest between sets. Athletes performed a maximum of six repetitions for each exercise, including pull-ups with bodyweight and draws with pulleys for 80-90% of 1RM over these sets. The EMS group (ES) applied the same jump-rope skipping warm-up for 10 minutes, then followed up with 15 minutes of electro-stimulation using a Compex Mi-Sport 500 unit. The latissimi dorsi muscles were simultaneously stimulated with a frequency of 100Hz for five seconds, with a 15 second rest period between contractions. There were a total of 45 contractions throughout the training session. The stimulation intensity, controlled by each individual athlete, was designed to correspond to 80-90% of maximal voluntary contraction according to athletes’ sensations. All groups, including the control group (C), completed 10 swimming training sessions per week for four weeks and the same aerobic dominant work. No important competitions were undertaken during this training period (April) and the strength training interventions ended six weeks before the national championships in held in June. After the training period, a significant increase in mean swimming velocity was observed in both the Strength Training (S) group and the Electro-Stimulation (ES) group, with both groups exhibiting velocity improvements four weeks following the end of the training period. There were no significant differences between the S and the ES groups at any point in time, while the C group showed no improvement throughout the study. Interestingly enough, after the four-week training period, stroke length was significantly improved for the S group but not for the ES group and the C group. Stroke rate was improved for both the S and ES groups, but not the C group. An examination of peak torque in concentric conditions at 60 and 180 degrees per second after the four-week training period revealed that the S and ES groups exhibited significant improvements, while the C group did not. When examining eccentric and isometric conditions at 60 degrees per second, only the ES group showed significant improvements. All of these results were consistent over the additional four weeks following the end of the training period. After four weeks of training using conventional strength training or electronic muscle stimulation, significant increases in sprint swimming performance were observed in national level swimmers. What I found interesting was that the strength training (S) group improved stroke length and stroke rate, while the electro-stimulation (ES) group only improved stroke rate. However, the ES group also showed improvements in eccentric and isometric strength, while the S group only demonstrated improvements in the concentric condition. Thus, conventional strength training seems to provide improvements in a specific sense (i.e. pulling action through range of motion) while electro-stimulation provided improvements in a more general and comprehensive sense (i.e. muscle recruitment abilities for concentric, eccentric and isometric conditions). Overuse injury conditions. In swimming, the shoulder joint can be overused to the point of chronic pain and laxity. During periods of high volumes of swimming, EMS can be used to effect strength improvements without stressing the shoulder joint. In other sports that rely on lower body strength improvements, EMS can be a useful replacement to conventional weightlifting movements that may over-stress the knees, hips or back. Minimizing central nervous system stress. In periods of high intensity training, EMS can be used to improve or maintain strength abilities without adding stress to the central nervous system. This is particularly important when volumes are high for the key training element (i.e. swimming, sprinting, high velocity throwing) and coaches may be concerned that supporting elements may be drawing CNS energy away from the primary goal. Improving general strength qualities. In many cases, a general approach to strength training may be the best approach. In a time when “sport specific” is a catch phrase, comprehensive training can prove to be extremely beneficial. As we discovered in the above research article, conventional strength training provided concentric improvements, while EMS provide improvements in concentric, eccentric and isometric abilities. EMS improves the ability of a muscle to contract – period. When integrated – in an organized training progression – with the coordinated, precise movements of sport, the benefits of EMS can transfer very efficiently, with no wasted effort or redundancy. 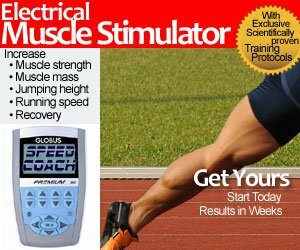 Hopefully, coaches and athletes will start looking at electro-stimulation as a viable means of improving strength for their sport. The research has been done and the results are fairly conclusive. And most of the people who haven’t had success with EMS simply are not using the technology correctly. My own experience with EMS has shown that it is an invaluable input into an athlete’s training program. Stop waiting and take the plunge. Just make sure the EMS unit isn’t strapped to you while you are jumping in the pool!